iCheck Express Word 2003 was written specifically for high school students. It is age-level and interest-level appropriate, and covers Microsoft Office Exam objectives for Word 2003 Specialist and Word 2003 Expert. 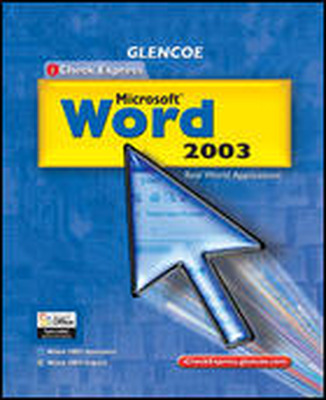 iCheck Express Word 2003 was written specifically for high school students. It is age-level and interest-level appropriate. Large, color "iCheck" screen shots let students know if they have successfully completed the lesson and can move forward to the next assignment. Step-by-step exercises provide easy-to-follow instructions. An Annotated Teacher’s Edition provides point of use instruction and helpful teaching strategies for all student skill levels. This book covers Microsoft Office Exam objectives for Word 2003 Specialist and Word 2003 Expert.